Well hello again! Look at that…less than a month to return to blogging! I am patting myself on the back right now. So I believe I’ve covered how all of my friends have been having babies this past year. I’m eagerly feeling ready for one of my own, but in the mean time, I had all of these pregnant friends who I wanted to bestow presents upon for their new bundles of joy. I adore picking out baby clothing as much as the rest of em…(side note – a 25 year old Stephanie would never have thought that…) BUT I thought I could do something a bit different. Custom artwork for a baby nursery felt like a great idea! One of my oldest friends Nicole had a beautiful baby girl named Eliana. As is common with living things you love, they quickly adopted a nickname for her of Elligator. So an alligator for her bedroom walls was a no brainer. I was a little stumped on a second animal to keep the alligator company but was happy to consult with Nicole on the topic. We were circling around the idea of sea horses when I recieved a text message out of nowhere one day that just said ‘hippo’. I consider it a sign of a great friendship when you can understand the meaning behind a single word text message. And so these two were born. These animals have been a lot of fun to create. I mentioned before how I’m trying to give them an animated, slightly cartoonish vibe, but need to keep it to my own style so that it doesn’t come across as mimicking another artists work. I feel like I’m still working on that, but these two were a lot of fun to work on. 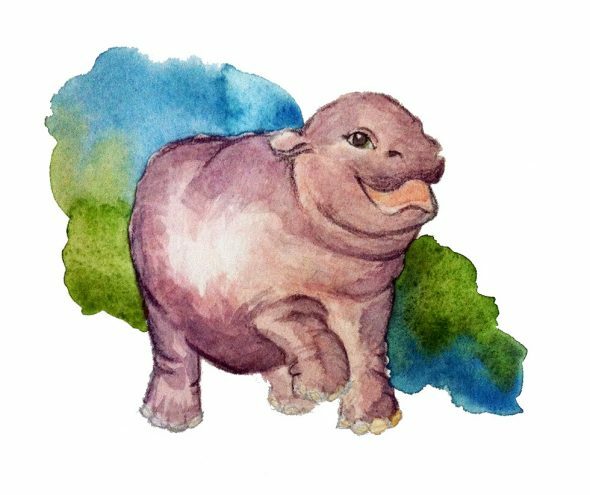 I used a different brush on the hippo – I should probably mention that over my time practicing and especially not practicing my art, I’ve accumulated a lot of paintbrushes. I probably own somewhere in the neighborhood of 30 brushes. I religiously use about four of them. True story. Sorry – I’m all over the place here I know. Back to my little hippo. I really liked the way the light worked out on her body. I think I get so excited with my paint sometimes that I oversaturate what I’m working on and make it harder to draw attention to light and shadows. I fluked out this time – and I am determined to keep trying to recreate that fluke. This entry was posted on Thursday, October 23rd, 2014 at 9:12 am. It is filed under General Musings, Kid Stuff and tagged with Musings, watercolour, yyc blogs. You can follow any responses to this entry through the RSS 2.0 feed.